I wanted to make a public apology to Beardy of The Mojo Beard who was the first to point out the problem with the Topps Sterling Honus Wagner card with this post and not Chris Harris from Stale Gum as I originally had attributed it too. As many of you know, Twitter has revolutionized the way information is disseminated. It's ability to deliver relevant, valued content direct to desktop or mobile in real-time is unprecedented and changing the way consumers absorb information. No longer is the end user required to seek information by going to a particular source. To maintain being relevant that source needs to come to the end user and today, that is done via Twitter. Personally, I used to have the time to go through my Google Reader/Blog Roll everyday but those days are long gone. From a time management standpoint I find the blogs I still read are the ones I am aware of that have posted something new. How do I become aware something new has been posted? You guessed it, my Twitter time line, which I check numerous times per day. The more pertinent question is as a blogger, why wouldn't you? You increase your audience, reach and site statistics. You can engage and aggregate an audience you might not have reached other wise and most importantly, you stay relevant. I honestly don't mean this to be a slap in the face or condescending to any of my fellow bloggers not utilizing this but instead to implore and encourage you to do so. It's extremely easy. I use Twitterfeed it takes literally seconds to set up, is totally turnkey and you never bother with it again. As a blogger, what you have to say matters. It matters to me and it matters to your other readers. You've chosen to use your voice for a reason. Why institute a self-imposed gag order on yourself by not broadcasting your message in real time, to a wider audience? As was brought to the attention of collector's last night by Chris Harris at Stalegum, Topps has made a serious mistake. I'm pretty sure that back in Honus Wagner's playing days they were still using flannel jerseys and not the Coolflo type used by MLB today. Regardless of the reasoning, as explained quite logically by Steven Judd at Sports Card File, Topps needs to admit the mistake and rectify the situation. Plain and simple. When you have gone to great lengths to capitalize on being the defacto baseball card company in the market, you have a certain responsibility to consumers and collectors. You need to operate with integrity and not ignorance, ethics and not arrogance. In my mind, these are the steps Topps needs to take in addressing the issue, but I would be willing to bet none of them will happen. 1) Conduct an internal audit and investigation to determine how this specifically happened. 2) Take measure, as appropriate, to insure it NEVER happens again. 3) Issue a Press Release admitting to the mistake, explaining how it happened and what changes have been made to insure another incident like this isn't repeated. 4) Offer the current owner of the card 2x the purchase price to have the card removed from the marketplace. 5) Provide the current owner a replacement. As dayf from Carboard Junkie has pointed out, yes, it could be worse, as we all remember this fiasco from last year, but this is pretty bad too. After the questionable departure of Chicago Bears' starting quarterback Jay Cutler due "injury", the brain trust on the sidelines though that inept and geriatric Todd Collins was the answer to their dilemma. Quickly realizing the their lapse of judgement, the trotted out Colorado State stand out and 2008 rookie, Caleb Hanie. Hanie proceeded to put together 2 touchdown drives and pull the Bears with in 7 points. With enough time to develop a sustained, clock consuming drive, Hanie eventually succumbed to the pressure throwing a game ending pick. To his credit, instead of looking like a fish out of water, he looked every bit as capable if not more so than the players ahead of him on the position depth chart. 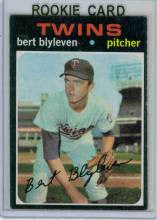 His cardboard had some instant interest as can be seen here in completed auctions yesterday. His 2008 Playoff Contenders autographed rookie and his 2008 SP Authentic RC #/1399 are both worth picking up, BUT, wait for the short lived hype to die down. Perusing eBay the other day, I cam across a rather unique item produced at the peak of the junk wax era. Between the years 1991-1992, as best that I can tell, a company by the name of TNTL Studios in Toms River, NJ produced this miniature boxed set of the infamous Black Sox team. 25 cards depict the entire team as well as owner Charles Comiskey and manager William "Kid" Gleason". The black and white cards measure 2" x 3" and designate the indicted players with a black border. The most famous player on that team, Shoeless Joe Jackson, has a duplicate card as you can see that has been colorized. Despite coming from an era of over production and regularly searching for Shoeless Joe items on the secondary market, this is the first time I have seen. 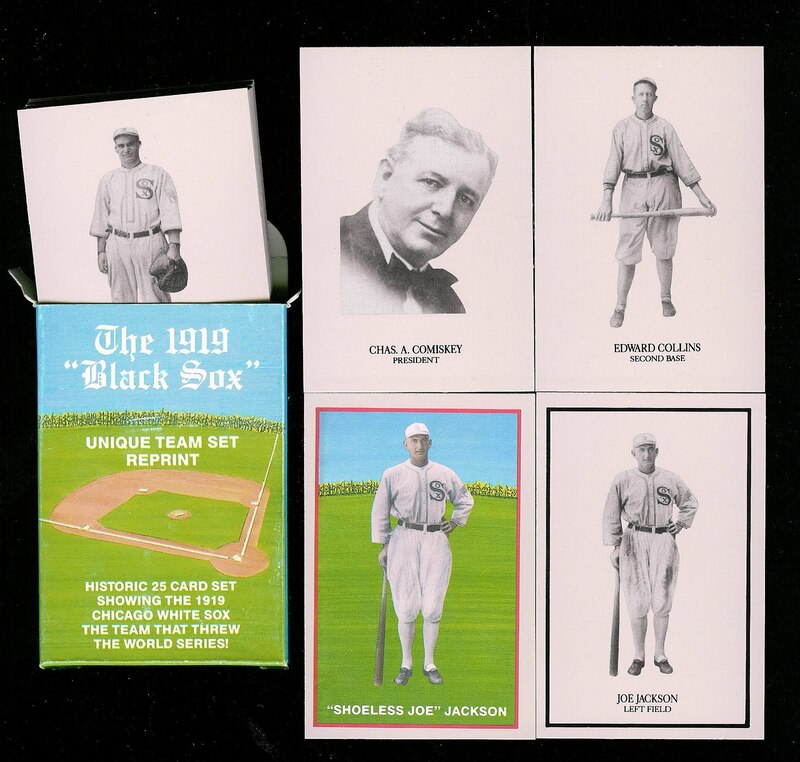 The cards are un-numbered and are blank backed with the exception of the Shoeless Joe Jackson cards which includes a short biopic. If you are like me, the term “Rated Rookie” conjures up the images of all things 80’s; Rayban Wayfarer sunglasses, Risky Business, the Mustang GT 5.0, the mullet, Member’s Only jackets, girls with “big hair”, Dire Straits, Def Leppard, Depeche Mode, Breakfast Club, Ferris Buehler, Ronald Reagan, punk rock, Prince, Flash Dance, etc . . . you get the picture. More importantly, to a collector from the 80’s, the term ‘Rated Rookie” means one thing; wax packs, and lots of them. Barry Bonds, Jose Canseco, and Roberto Alomar are just a few of the names that immediately come to mind as players who have worn the title in generations past. Panini seeks to reconnect with this feel good brand name in the all-new 2010-11 Donruss Basketball. Krause Publications, and later F+W Media is the victim of a problem facing many, many media companies and one I am all to intimately familiar with personally, having been a victim of a layoff from a media and publishing company last April. My dislike and distrust of Beckett Media aside, I think I can bring some perspective and shall we say, calculated logic, to the discussion of the pitfalls facing both of these hobby media resources. something that traditional publishing companies have been struggling with since the invention of the Internet by Al Gore in the early 90's. (I'm STILL convinced that is why he lost the election, what an idiot but I digress). Regardless of if you are a major publishing icon like Rupert Murdoch or a niche publisher like F+W, the inability of publishing companies to effectively monetize an online strategy has effectively served as the demise for numerous publishers. The ability, or in some cases, inability, to grasp the importance of social media has further plagued traditional media companies and publishers who have long relied on an antiquated business model of disseminating information and waiting for readers, users and consumers to come to them. The world doesn't work that way anymore. if you aren't bringing me the information I want, chances are I have little time or interest in seeking it out. A great example of this in the blogsphere is my friend, Adam Gellman, at Sports Cards Uncensored. I have asked him repeatedly to set up a Twitterfeed for his blog. Why? Because most of the time, it's the only way I will know a blog I value, follow, or have interest in has published new content. He still hasn't done so and to this day I can say I read his post less than I used to because he is not pushing that information to me. Now look at Krause/F+W Media who of all Hobby related entities needed to get ahead of the curve when it came to social media and instead languished in an archaic information dissemination model. They proved how incapable they were of adapting to new media just last year when, having been pressed on a particular issue, columnist forced blogger, T.S O'Connell turned off comments on his blog. In my humble opinion, no act more symbolized the disconnect and lack of understanding about the developing age of media than that act and the fiasco that resulted. Now, looking at my friend and yours, Beckett Media LLC, we see a much different story. Have they capitalized on the mistakes of Tuff Stuff and avoided the same pitfalls? Yes. To a degree. Now in all honesty, the following will obviously be subject to conjecture but I will try to approach this with some calculated reasoning. The removal of Tuff Stuff's Sports Card Monthly from the equation, leaves potential advertisers only one place to spend their print ad budget and that is with Beckett, obviously. However, in my opinion, there is little doubt that even with this event having transpired in the market place, that Beckett's publications could NOT survive as a stand alone business property. The decrease in ad revenue across ALL print media simply can't be replaced regardless of the number of print or OPG subscribers they add. No, the publications will continue and might even at some point return to profitablity as the result of them being only one cog in a machine. The Beckett brand name will forever be tied to their publications. That brand awareness and recognition serves as a "traffic driver" of sorts for their other properties; Beckett Select Auctions, Beckett Grading Services, and The Beckett Marketplace. Diversity has been the key to Beckett being able to weather the media storm and to their credit they have been much better at developing online revenue streams and embracing, instead of resisting, social media. While I am obviously not privy to their balance sheet, ad rates are public. Keep in mind also that most advertising sales reps. never, ever, ever, ever sell at rate card but instead discount those rates as an incentive to buy. So if you take their listed rate card pricing and count the number of ads you see in an issue and multiply out the math from subscription $'s and their circulation numbers, you can see that when you account for employee salaries and benefit costs, variable and non variable expenses, etc. it would be very hard to see profiting solely from their publications. Media is changing, and the demise of Tuff Stuff is sad for the simple fact that, right or wrong, in the mind of many collectors, old and new, Beckett will continue and now even more so, serve as the sole voice of an industry. Complete details, pricing, checklist info here. I don’t get it, plain and simple. My parents always taught me that if you don’t have anything nice to say, don’t say anything at all. Unfortunately, when it comes to product reviews and editorial, we don’t have that luxury and instead have a responsibility, to you, the collector, to provide unbiased opinion and commentary on the products we receive. So instead, I’ll try to keep this brief. In a nutshell, 2010 Topps Prime Football is an uninspired hodgepodge of other brands that has been forcibly morphed into a gruesome and sinister hybrid. In addition to the unnecessary monstrosity that is Prime Football, it is packaged in the most un-eco-friendly McDonald’s apple pie type boxes, per pack. All this serves to reinforce the fact that Topps Prime Football is nothing more than a bunch of fluff with no redeeming substance. THIS GUY GETS IN BEFORE ANYBODY ELSE! GOT IT!! Well it looks like a couple of cases of Panini's Century Collection have been broken and their contents listed on eBay. A couple of quick observations as I really love the concept of these types of products. With their all encompassing checklists serving as a cross section dichotomy of American history, sport and pop culture. It's the execution of the product that usually leaves me disappointed. 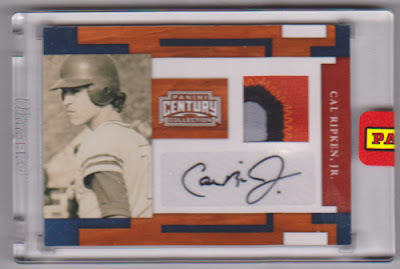 As a Cal Ripken Jr. collector, I think I am actually offended by what an eyesore this card is to look at. 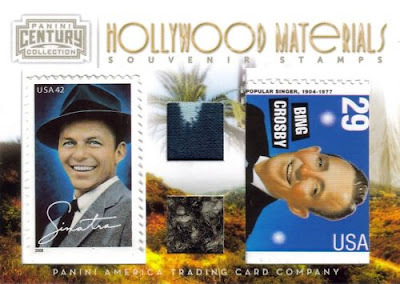 I don't care that the orientation of the Bing Crosby stamp is horizontal. 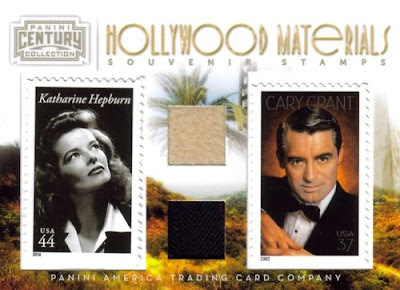 If you are going to place it in a vertical cut out, you have to position the stamp the same way even if it means cropping the white strip you see on the top and bottom of the stamp as it sits now. Here is a link to the complete listings. Did you catch the New Year's Eve edition of the Card Corner Club Radio Show? Doug and I went through the below list individually and discussed our choices and reasoning on air. Take a listen to the show. Best thing(s) to happen to The Hobby? Worst thing to happen to The Hobby? Really? Remember when Bowman was "Home of the Rookie Card"? Now what is it? The home of the prospect and gimmicks? The home of "We Can't Come Up With an Original Brand and Name"? I have long despised Topps thumbing their nose at the 'rookie card rule'. While I don't necessiarily like having a designated RC logo on the cards themselves, I understand the spirit for which the rule was created. Quite simply being to alleviate confusion in the marketplace and allow for novice collectors and casual fans to easily identify which card is a player's "TRUE" rookie card. Bowman DPP doesn't as a brand doesn't aid that goal and only makes it more confusing. Platinum and Sterling, while cute with the whole family of metallic compound thing, are really unneccesary products. Bowman has become so redundant as a brand it borders on the ridiculous. It's bad enough that, with the exception of Platinum and Sterling, you can hardly tell one year from another. The worth of the whole brand has been reduced to a refractor chase rendering even the base RC cards within the Bowman family line of products virtually worthless.As for BDPP again, if I wanted players in their minor league uniforms, I'd buy those products. And whatever happened to Bowman's Best? With an auto per pack and only $10, that was a way better product configuration than Sterling. What do you think should be done with the Bowman brand of products?